Aquamarine evokes the purity of crystalline waters, and the exhilaration and relaxation of the sea. It is calming, soothing, and cleansing, and inspires truth, trust and letting go. In ancient lore, Aquamarine was believed to be the treasure of mermaids, and was used by sailors as a talisman of good luck, fearlessness and protection. It was also considered a stone of eternal youth and happiness. [Simmons, 49] Today it protects all who travel by, over, or near water, and opens the channels of clear and heartfelt communication. The name Aquamarine comes from the Latin aqua marinus, meaning "water of the sea," and refers to its sparkling ocean-like color. The pale blue, transparent crystal is a member of the Beryl family. Its color, sometimes bluish green, is caused by iron oxides within the chemical makeup of the stone. Ancient seer considered it to be under the influence of the moon, an orb exerting very great magnetic influence. Present day supporters of crystal-gazing suggest that when using an Aquamarine to view coming events, do so when the moon is increasing. The magnetism of the moon on the included iron oxides will strengthen the stone's forecasting ability. Aquamarine is the blue variety of Beryl, though the Beryl family forms in other colors used as gems, such as green Emerald, yellow Heliodor and Golden Beryl, pink Morganite, Red Beryl or Bixbite, and the colorless variety, Goshenite. The Throat Chakra is the voice of the body, a pressure valve that allows the energy from the other chakras to be expressed. If it is blocked or out of balance, it can affect the health of the other chakras. In balance, it allows for the expression of what we think and what we feel. We can communicate our ideas, beliefs, and emotions. When the throat chakra is in balance and open, we can bring our personal truth out into the world. We have an easy flow of energy within the body and spirit. The energy that springs upward from the lower chakras can continue its path enabling free expression and natural release. Pale blue Aquamarine is the color of the winter sky giving way to spring. As the sun moves higher each day, it marks the beginning of life and emotion, helping us reflect on, question, and relax in our acceptance of the life we have. Light blue talismans help us develop patience, reconcile differences, or seek forgiveness. They're excellent for recovery efforts from addictions or destructive patterns, aid in curbing tempers, and help us become more dependable and cheerful. Light blue crystals also assist in dealing with grief, letting go of the past, and curing guilt. Aquamarine in pale turquoise shades provides a fresh, welcome energy that moves us to serenity as new growth and life emerges. It brings hope, discovery and balance. It returns us to center. In lighter shades, Turquoise energy promotes inner harmony and peace through spiritual understanding. If your birthday falls in any of the following periods, an Aquamarine of the color listed can be a valuable conduit to your Guardian Angel. The table also provides the name of the Guardian Angel of those born in the time period. There are other Angels that are partial to Aquamarine. The table below gives you the information about them. Aquamarine is the traditional birthstone of those born in March. Pale blue Aquamarine is one of the true birthstones of those born as the world awaits the vernal equinox and spring (February 19 - March 19). This is a time when new life is about to burst forth, a time of faith and trust. Aquamarine is the zodiac stone for those born under the sign Scorpio, at the end of harvest, from October 23 - November 21. Scorpio is represented by a scorpion, and is known as the Success sign. Scorpios are complicated, independent, and creative with a sense of humor. They are excellent leaders and sometimes a bit competitive. 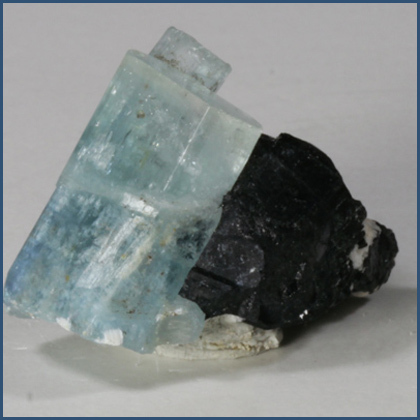 Aquamarine is a Seeker Energizer crystal. Seekers contain the crystal energy structure that aligns the natural energy of the crystal to the natural power of the human mind to find the way to new horizons and new capabilities. They're pointers, directors, and compasses; the fresh start crystals. These are talismans of the scientist, the adventurer, the hunter, wanderer, and explorer. They're also crystals of the student and the researcher. Energizer crystals, such as Aquamarine, are powerful conduit crystals for focusing and amplifying the Universal Life Force and our energy to accomplish our goals. They aid in our efforts to gain what we seek, enhance our lives, protect what we value, and defend us from undesirable elements. Aquamarine utilizes Water energy, the energy of stillness, quiet strength, and purification. It embodies potentialities unrealized. It is yielding, formless, yet powerful. The Water element brings power of regeneration and rebirth. It is the energy of the circle of life. Use Aquamarine crystals to enhance any space that you use for repose, calm reflection, or prayer. Water energy is traditionally associated with the North area of a home or room. It is associated with the Career and Life Path area, its flowing energy assuring a balance of energy as your life unfolds and flows.